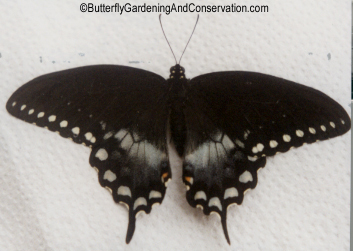 Spicebush Swallowtails are beautiful butterflies, whose caterpillars are one of my most favorite of all. 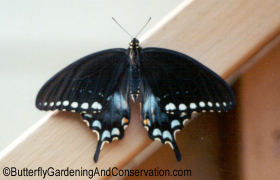 The adults have a wingspan of 2.5 - 3.8 inches. Their range is most of the eastern half of the US, except extreme south Florida and Texas. The two most commonly used host plants are Spicebush - Lindera benzoin and Sassafras - Sassafras albidum. 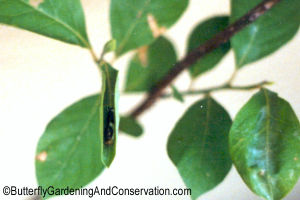 Spicebush Swallowtail eggs are laid singly, usually on the underside of leaves. They are a whitish/greenish color. 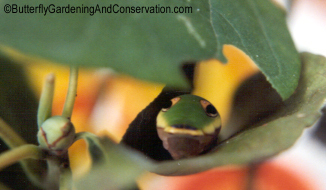 The caterpillars make nests of the leaves by spinning silk and curling the leaf up. They mostly hide in the nest in the daytime and come out at night to eat. 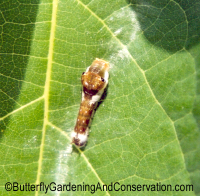 Because of this it is more difficult to follow when they molt and keep track of which instar they are in. They make the nest by laying down silk on the leaf that they want to curl up. You can see them doing this, they start moving their heads back and forth while moving along the leaf. Eventually the silk dries and cause the leaf to curl/fold up. 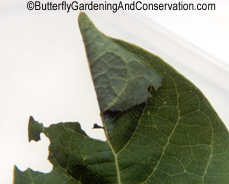 When younger the caterpillars tend to eat away part of the leaf and just fold over a flap of it. As they get bigger they fold over an entire leaf. 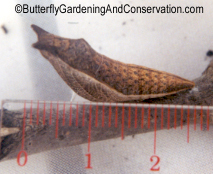 The way this leaf is folded over is an obvious sign of a small Spicebush Swallowtail caterpillar. This picture shows a somewhat bigger caterpillar in a completely folded up leaf. caterpillar, most likely late 1st instar. 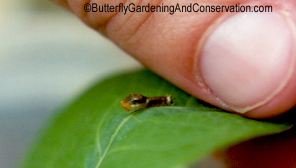 First instar caterpillars are small and a brownish/greenish/bronze-like color. 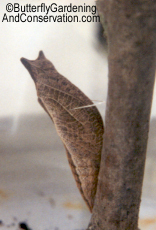 The caterpillars typically rest on the center most vein of a leaf. Young ones, such as the one in the picture on the right, haven't yet had a chance to make themselves a nest. 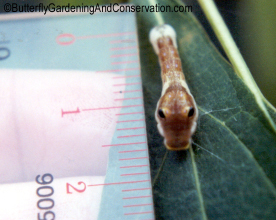 Second instar caterpillars start to show other markings and coloration including the fake eye spots, which can just barely be seen in these pictures. 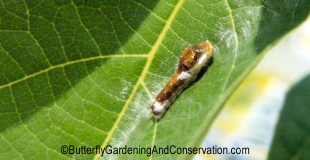 Notice the white areas on the leaf in the picture on the left, this is silk the caterpillar has used to make its nest. You can see in this picture that the leaf is starting to curl up too. 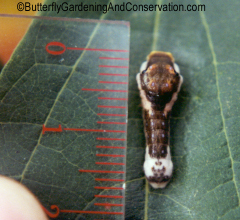 Third instar caterpillars look pretty much the same as 2nd, but bigger. The fake eyespots are more visible though. 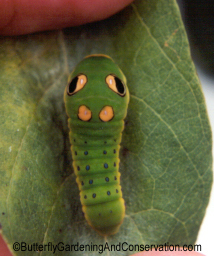 Fourth instar is bigger yet, with even more visible eye spots. 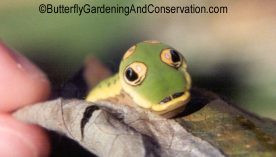 Fifth instar Spicebush Swallowtail caterpillars are really fascinating! 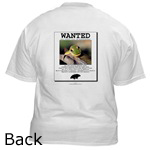 They are bright green with numerous blue spots with thin black outlines. Their eyespots are much bigger, with the black part being kind of shiny. They also have two other secondary fake eye spots that are yellow. The bottom half of their bodies are a sort of pinkish color. Viewed from certain angles they look like a small snake, to help scare off predators. View from front, showing head capsule/face. View from front/top, looking like a small snake. 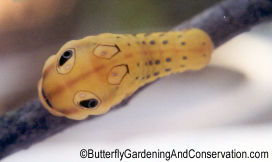 Before they pupate, Spicebush Swallowtail caterpillars turn a bright yellow color. 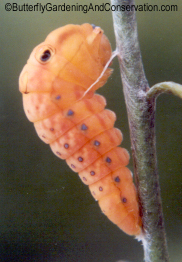 This one has found a place to pupate and has attached itself to a stick with silk, but has not yet done its last molt. This caterpillar formed its chrysalis on the inside of a jar, so I was not able to get very clear pictures of it. 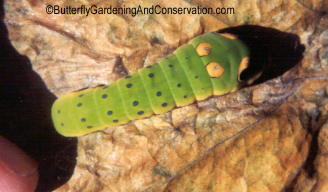 The chrysalids of Spicebush Swallowtails look like dead or dying leafs to protect them from predators. They are either green with brown edges or brown. Supposedly the length of light determines if they will be green or brown. 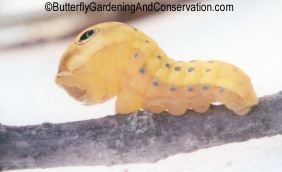 According to this idea late fall caterpillars, when the days are shorter, should form brown chrysalids and will over winter as pupa. And when the days are longer, green chrysalids should form, which won't overwinter. 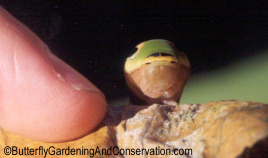 However, the green one in the picture on the right was raised in short days with low light and is overwintering as a pupa. 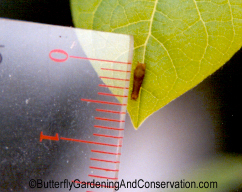 This caterpillar formed a brown colored chrysalis. Notice how much it looks like dead, brown leaves with veins like on a leaf. 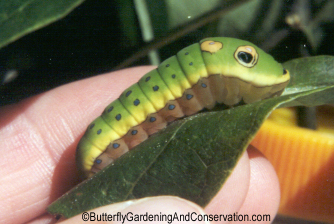 Additional pictures of 5th instar Spicebush Swallowtail caterpillers. 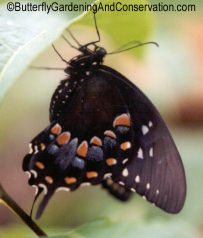 Great items with Spicebush Swallowtail images on them available now from my Cafepress store! 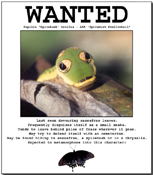 Spicebush Swallowtail caterpillar on 'Wanted' poster! Last seen devouring sassafras leaves. 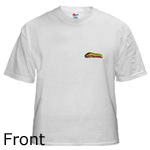 This design available on t-shirts: men's sleeveless, value shirt, Women's t-shirt, children's, kid's and more! This image is available on magnets, mugs, and t-shirts!